The contenders in a High Court boxing fight never had a cross word until they fell out over money, a judge has heard. 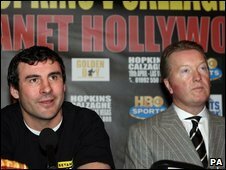 Boxing promoter Frank Warren claims undefeated world champion Joe Calzaghe owes him £1m for breaking a verbal contract over a fight deal. But, the Welsh boxer claims his former manager owes him £2m in unpaid fees. Edward Simons, of Mr Warren's Sports Network, told Mr Justice Wyn Williams that his boss had a "good working relationship" with the Calzaghe team. Mr Simons, Sports Network's company secretary, told the High Court hearing he believed the boxing promoter had always been on good terms with the Newbridge-based boxer and his trainer father, Enzo. He said: "I have never seen Frank exchange a cross word with either Joe or Enzo prior to this litigation." Mr Warren managed the boxer for 10 years from 1997 until Mr Calzaghe split from him to promote his last fight in 2008 and retire undefeated from the ring. Mr Simons continued: "I always understood that Joe was happy with Frank, and happy being promoted by Sports Network and this continued for the whole of the time I dealt with them until this litigation." Mr Warren claims the boxer owes him £1m for breaking a verbal contract to fight one more time for him, while Mr Calzaghe is counterclaiming more than £2m in fees for his fight against Bernard Hopkins in 2008. Mr Simons, giving evidence on the fourth day of the trial, which is expected to last until next Monday, said Mr Calzaghe had told him that he thought Mr Warren was "generous" towards him over money. He said that after one meeting to discuss a new contract, Mr Warren gave the boxer an expensive watch and "I remember Joe hugging him". "Joe states in these proceedings that he had no alternative but to sign the agreement. "Joe did not indicate at that meeting, or otherwise, that he did not want to be promoted by Sports Network or that he felt forced to sign the agreement." The case was adjourned early on Thursday to allow the judge to hear new evidence from a recording of an interview given by Mr Calzaghe, whose evidence will now be heard on Friday.